Can’t recommend a Revolut Card highly enough. Save a bundle on exchange rate and avail of chip, PIN and contactless. I would advise against the Revolut card. Unless you subscribe to "premium" ($9/month) you get hit with surcharges and limits....and if your transaction gets cleared outside of "standard exchange hours" (which can easily happen) you will get hit with ADDITIONAL fees and surcharges. What? Never had a charge in two years of use. Its done nothing but save me money in fees and in exchange rates. It’s prepaid, so what could go wrong? If it doesn’t work out for you, throw it away, end of. It looks like the "new" Australian Amazon doesn't ship overseas? It says on the listing that it can't ship to UK mainland. I wasn't planning to buy buy thought I'd point this out. Maybe they send to USA though? Perhaps somebody would click and see? Won't ship to Canada either. Would u like me to bring them over in July? No thanks, I wasn't going to order anything. I was just telling folks that it seems Australia Amazon only ships to Oz.. Yes and it's the same deal on The Sound of Vinyl. Both are really outlets for Universal Music Direct Ltd. 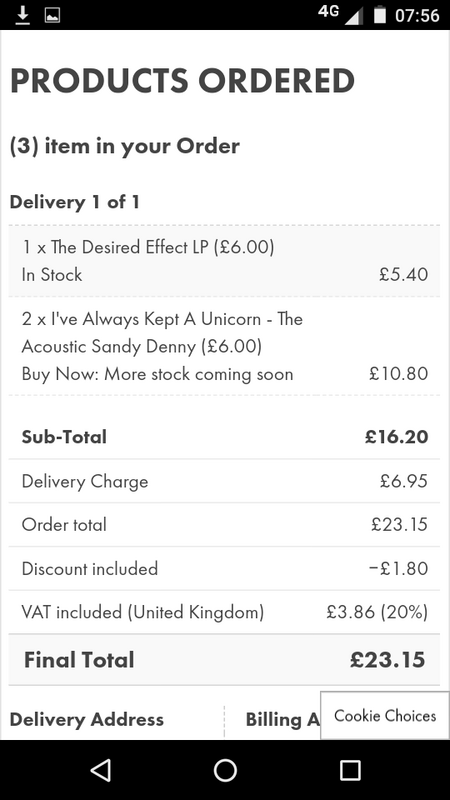 I bought the 2LP Sandy Dendy Acoustic for £6. Yeah, I went for that - even though I've already got the (longer) CD - and Nick Drake's Family Tree. Both £6 + £3.95 delivery. HMV UK are also having a 50% off deal on vinyl LPs plus free UK shipping for £10+ purchase. Some cheap stuff here too! Yes, I've always backed away from a purchase of Family Tree as it's pre-debut demo stuff - always seemed a bit scraping the barrel. But it's got pretty good reviews and at £6 I can always flog it. Me too - thought it was probably a bit cack. It is always on offer - so let us know if it is good. Yes that's the best way to do it. I got charged £6.95 courier when I pre-ordered the new Killers Ltd clear vinyl box a while ago too! You can only get the standard black vinyl box from Amazon. Due next week! For people buying for first time you get a 10% voucher after registration with Sound of Vinyl. I used it to bring down that box set by £22.50. The Killers Ltd Clear Vinyl box £225.
? I ordered 2 x Sandy Denny and 1 x single LP and got charged 3.95. Lucky you. I did the same and they charged £6.95...maybe because you are in Belfast? I'm in London...still a bit odd? I’d post my order by way of proof but the single LP is ABBA and I don’t want anyone thinking it’s for me.